Mix ground pork and ground beef together using Kitchen Aid with paddle attachment or by hand. Stir in the cilantro, parsley and green onion. Add salt, ground pepper and milk. Heat a large non-stick skillet over medium heat. Add enough canola to cover bottom of pan. Use two skillets to speed up the process. Place a heaping tablespoon over 1/2 of the tortilla. Spread the meat over 1/2 of the tortilla, leaving about a 1-inch border. Brush water on the entire border of the tortilla; enough so you can see that it's wet, otherwise it won't seal. Press the sides together and seal with a fork. 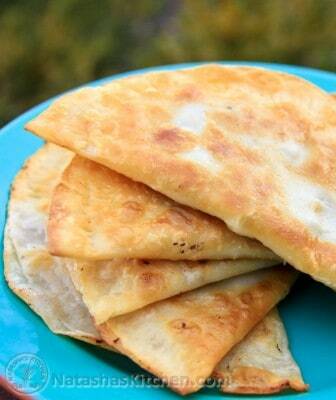 Flip the tortilla over and seal the other side with the fork as well to make sure they don't open while frying. Saute 3 minutes on each side over medium heat. You may need to adjust your heat settings (not all ranges are created equal), but they do need about 3 minutes per side to cook through. Place them between paper towels when done. They can get a little juicy inside so be careful that you don't get a lap-full of juice when taking a bite.